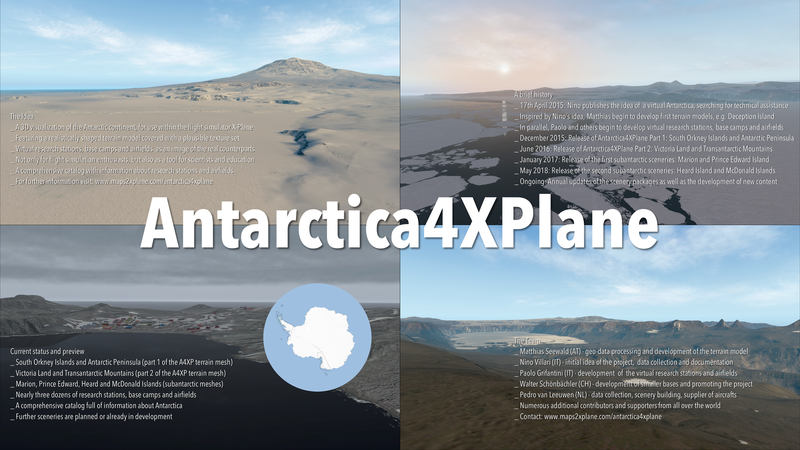 What a great opportunity: Antarctica4XPlane will be present at the POLAR2018, which will take place in Davos, Switzerland from 15 – 26 June 2018. The POLAR2018 conference is a joint event from the Scientific Committee on Antarctic Research SCAR and the International Arctic Science Committee IASC. This Antarctica4XPlane factsheet will be part of a poster informing about the Memoriale dell’Antartide “Valle Italia” (MAVI). An initiative, leading by professor Julius Fabbri, to remember Renato Cepparo‘s expedition to Antarctica back in 1975-76, the inauguration of the Giacomo Bove Station on 20th January 1976 and its deconstruction two years later. Julius and his students at the IISS Bassa Friulana high school created not only posters and models, they builded also an exact replica of the ruins of the Giacomo Bove Station. In addition, Pedro, one of the Antarctica4XPlane add-on developers, recently developed and released a virtual rendition of the Giacomo Bove Station as it was build in Italia Valley back in the year 1976. NextA tool to edit X-Plane Meshes: What’s new and next?